As a veteran vegetarian, Marloes Reinink has recently made the transition to an entirely plant-based diet. Here she shares her experience, as well as some key motivating facts and figures about how our food choices affect the environment. Having been a vegetarian for 18 years, something started to itch and the thought of eating animal products such as dairy, cheese and eggs started to bother me. But, as a proper cheesehead from the Netherlands, I did not think I could live without cheese! And that was a terrifying thought for quite a while. However, things changed when I watched a couple of documentaries about food and its impact on the Environment (‘Cowspiracy’) and on our health (‘What the Health’). I knew I had to give it a try. I started off with a month, and a month became two months. Then there was a fall-back, but I got back on track. And now, 4 months later, I cannot imagine eating animal products ever again. And yes, I am feeling healthy. And no, I don’t only eat salads. You have to adjust your lifestyle to suit this vegan or plant-based diet (diet as in ‘eating habits’), but it is very much worth it. I make sure that I always have lunch prepared, because otherwise I end up lapsing as there are not too many vegan take-away options. Most of my friends were sceptical in the beginning but are actually very supportive now after learning about the health, environment and ethical effects of eating animal products. A frequently asked question is “Where do you get your protein from?”. Sufficient protein is readily available from natural plant-based sources such as pumpkin seeds, hemp powder/seeds, chia seeds, tofu and soy beans (edamame beans!! ), beans in general and lentils, quinoa, millet, nuts, and so on. In fact, a growing number of top athletes thrive on plant-based diets – for example, tennis superstars, Venus Williams and Novak Djokovic, and ultrarunners, Rich Roll and Scott Jurek. It takes approximately 7,500 litres of water to produce a steak – which is equivalent to taking a shower 125 times (this is 4 months of showering for a person taking a 5 min shower with 12 litres per minute per shower every single day!). For every kilogram of fish caught, up to 5 kg unintended marine animals are caught and then discarded as by-catch. This to me is just mind blowing – even if it were 1kg by-catch, 1kg is still too much. And then on top of that, 75% of the world’s fisheries are exploited or depleted. Animal Agriculture is responsible for 90% of the destruction of the Amazon, which has either been cleared for grazing grounds or to grow food for the animals. The carbon footprint of a vegan is 50% that of a meat eater. 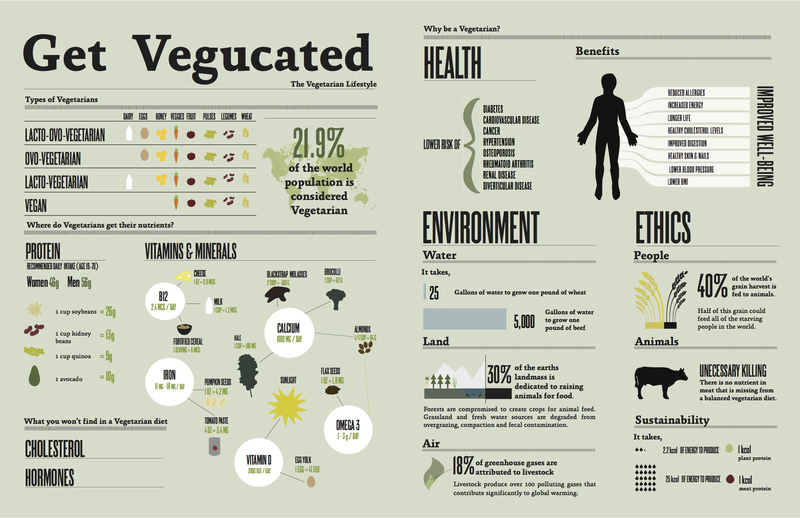 Creating vegan food uses 13 times less water, and 18 times less land than meat production. A dairy farm with 2,500 cows produces as much waste as city of 411,000 people. 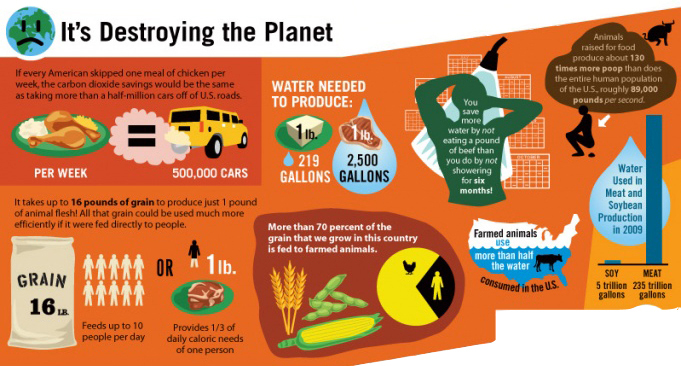 Grain that is used to feed the animals-to-eaten could feed 1.3 BILLION(!) people. In a nutshell, if the world population minimised its meat intake, we would make huge strides towards saving the planet from climate change. And very cheaply too, as it is simply a behavioural change. Unfortunately, with a rising world population and the hunger for a Western Diet, eating habits are unlikely to change. On the bright side, there is a fast-growing market in plant-based meat replacements, with Bill Gates, the Humane Society and Tyson Foods investing in Beyond Meat, a Los Angeles-based producer of plant-based meat substitutes that began distributing its products throughout the US in 2013. Dairy farms are also beginning to make the transition, with enterprises such as New York-based Elmhurst Milked now using nuts, oats and rice to create milk in response to a 40% decline in traditional milk consumption over the last 50 years. So, while we are saving water and energy in our homes and offices, we should also consider how incredibly effective we could be in saving these resources by eating fewer animal products! ← Prev News ItemLiving Building Challenge – A reality for South Africa?